This 1970s studio portrait was displayed in a small frame on a desk in an office for twenty five years. A cardboard matte covered the right and bottom sides of the photo, so it has suffered very little light fading, just normal dye loss for a print of that era. The office fluorescent lights destroyed most of the dye in the exposed part of the photo. The print also yellowed substantially. Consequently, the portrait is very washed out with almost no visible highlight detail. 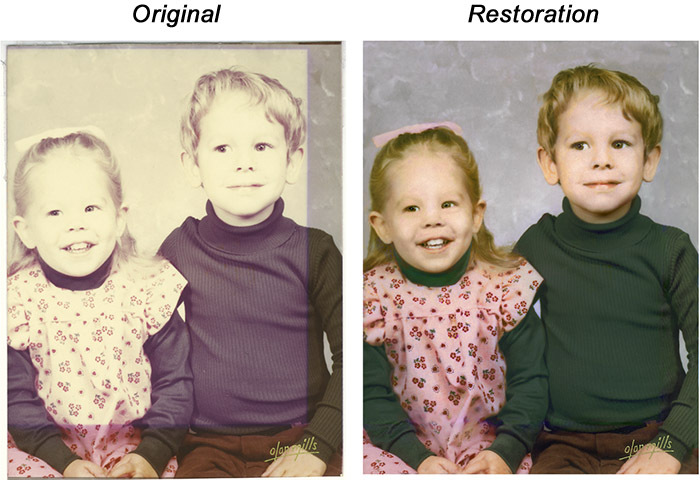 I repaired this photo in two stages. Because the covered edges hadn't deteriorated very much I restored them first. Once I had the tone and color correct there, I adjusted the image in the badly faded square until it matched the borders. Very little 'retouching' was done; almost all the improvement comes from restoring original detail and color, not painting it in.